Lol. I’ve got 3 of the 12’ 2.25 TC. Was toying with the idea of getting a 4th. I finally joined in on the big buff action. PB 50 lb. Congrats on the pay off for hard work and persistence! Have you been following the ATC 2015 ? Congrats to all. Wish I were there. Already looking to make it in 2016. Curious about the blue cat record. 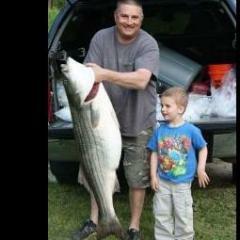 Who caught and how big? The ATC 2014 Online Leadeboard is here! Neil and Keith, thank you for all of your hard work. Congrats to all who participated! It was awesome seeing old friends and new faces. The ATC is a very special event. I cannot thank Neil Stern deeply enough for all of his tremendous efforts and labor over the year. A Neil Stern production is not just a tournament, it is an event! Neil, you are awesome! Kudo's to the winners! That was very nicely done. The pictures turned out great as well. The future of CAG is in good hands with guys like these growing with the organization. Best wishes everyone. Pavel - Sincere congrats and praise for banking the fish so many have dreamed and wished to catch. 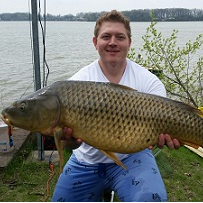 The first 50 lb plus Carp caught by a CAG member in North America! Outstanding. I wish you continuing success. Scott - From the looks of it, you've arleady been making terrific progress. Keep up the good work! I am definitely looking forward to seeing as many folks as possible at the ATC! It is one of the highlights of each year. I'm predicting a slew of 33-35 lb fish this year. Last year produced lots of 30-32 lb fish. I think these are the same year class that we used to catch at around 22 lbs (Bannies for the old timers!). Thanks guys. I appreciate the positive feedback and reinforcement. Karl, thanks for mentioning it in the US Carp Pro mag. Rob, I've stayed off the Hydroxy Cut. I must admit I do hit the caffeine pretty hard though, especially in the morning before doing fasted cardio. I started off just eating healthier and eating less. Instead of ordering the dinner portion at lunch, I started staying out of the restaurants and bringing a healthy lunch to work. In the beginning I was gradually progressing to more cardio (Elliptical mostly) 3 or 4 times a week. After about 40 or 50 lbs, my loss slowed to almost a complete halt for about 6 weeks. I saw that as a moment of decision. I could get frustrated, quit, and go back to being fat like I've done before... OR I could really invest myself in researching and studying nutrition, fitness, and fatloss and find a way to break through the plateau. Fortunately, a lady at work who is in great shape mentioned that I should check out an all natural body building program by a guy named Tom Venuto. Tom has a huge ebook called "Burn the Fat, Feed the Muscle." The basis of his approach is that you've got to eat enough to support your LBM while still creating a calorie deficit through a combination of calorie restriction and excercise (both cardio and resistance). He's also really big into the mindset/goal setting aspect. No program, no matter how good, is going to work if you can't get yourself to stick with it. The mindset stuff helps drive the compliance. Anyways, a lot of what he was saying was stuff I already knew to be true (ie. I alone am responsible for my health, there is no such thing as a quick and easy fix, weight loss is simple but not easy.) He also presented a lot of the techniques fitness competitors, body builders, models, etc use. The guy has definitely researched this stuff and has successfully applied much of it himself. He's not afraid to admit though when the science has not yet proved or disproved a point. I liked his technical approach. That said, I probably would not have forked over the money for the ebook based on the website alone. There is always so much HYPE around weight loss programs, it's difficult to tell what is legit and what is just slick marketing. I don't care for the hard sell. But since I trusted the personal recommendation of my co-worker, I bought the book. I am very pleased I did. Someone asked why I let myself get that big and what caused me to change. Those are very legit questions that strike close to the heart of the matter. I got that big because I compartmentalized my life. I felt that it was good enough to be smart, to be a good fisherman, to do well at my job, to provide for my family. I didn't feel the need to take care of my body. I let myself eat whatever and however much I wanted. Basically, I just let myself go and the pounds piled on. I've always tended to be fat, but after getting married I really started piling on the weight (not exactly fair to the Mrs. BTW). What turned the page for me was playing with my kids. We were just playing on the floor in front of the TV. I noticed that just getting up off the floor left me dizzy and breathless. Add to that the fact that I became a father in my late 30's and am now in my early 40's I started to think about the implications of staying on the course I was on. I wouldn't be able to play basketball, soccer, t-ball etc. with the boys like my dad had done with me. Perhaps I wouldn't live long enough to see them grow into men or to someday see grandchildren. I just realized how selfish and self destructive I had been. That realization is what got me started, and it is the emotions tied to the underlying reason that have really fueled my motivation and determination. You can only last so long on will power though. So establishing habits that don't require acts of will power is also extremely important. Sorry to ramble on so much, but I've been pouring myself into this fitness stuff as much over the past year as I used to into carp fishing. I still LOVE carp fishing, but my personality is such that I often dive 100% into something almost to the exclusion of everything else. That's been the case with Fitness vs Fishing over the past year. The good news is that thanks to one, I'll be able to do the other with my boys for a long, long time.